Log into Acquire. From here, select the "Proposals" button. Now select the circular plus button on the bottom right. You can choose a customer by either typing their name in (it will autofill), or if they're a new customer you can select the plus icon on the far right. 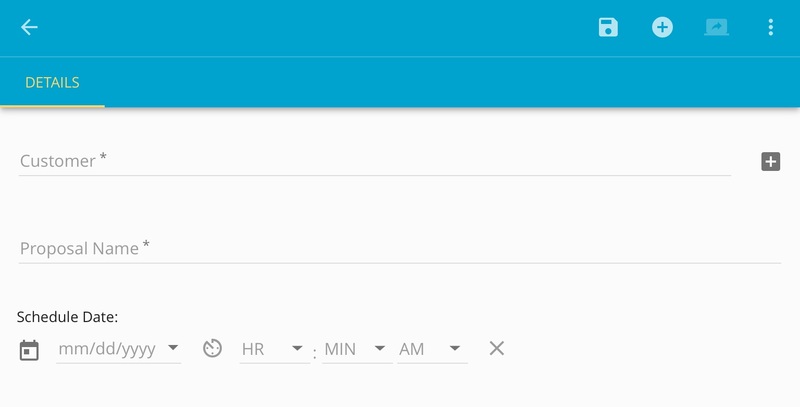 You can now title your Proposal, and below that add the scheduled date/time. Tap the save icon on the top right, and then the circular plus next to it to add a Proposal Option. To find out how to create Templates, please click HERE. Make any changes you may need to make to the template. Add more Templates as needed by again pressing the + button. The Present Button will display the current proposal in a way that will look very similar to how a Technician will show it to a customer in the field using a tablet.